With sailing we're back to the cool colours that I love so much. Every shade of grey, muted blues, flashes of white. It's no surprise that people go to stare at the sea on their holidays. The distant horizon, the soothing colours, the slow pulsing of waves on the beach, it's all designed to drop your blood pressure way down low. I'm no sailor, but I'm guessing that sailing can raise it way back up again. Crashing through big seas, skimming white-topped waves, leaning into the wind and holding on for dear life - it's got to be exhilarating don't you think? The ocean is seductive, calm and hypnotic at times, but turning angry and dangerous in the changing of a wind. I suspect it's addictive, sailing. Always different. Always exciting. And a million miles away from the cares and stresses of life on land. But something else I know. It's expensive. I've heard it compared to ripping up fifty pound notes while standing in a cold shower. These kinds of boat are surely just for the wealthy. Sailing isn't a pastime for ordinary people. You couldn't save up your dinner money and buy yourself a boat or anything. Except, well, if you were very determined, maybe you could. 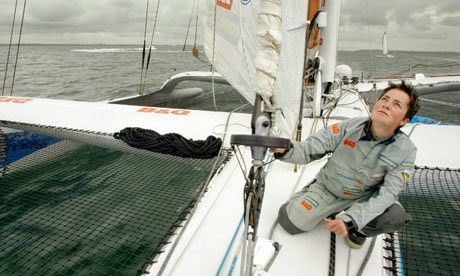 This is Dame Ellen MacArthur. Her parents were teachers and she grew up in landlocked Derbyshire, but a combination of factors, including a holiday with an aunt on the coast and the reading of the Swallows and Amazons books, meant that she fell in love with sailing at a young age. To buy her first boat, an eight-foot dinghy, she saved her dinner money for three whole years. She'd take a little food from home, an apple from the fruit tree, and every single day she'd save the money for her meal, until at last she had enough for a boat of her own. Amazing no? She spent hours at libraries reading everything she could about sailing. She worked at a sailing school whilst still in education, and by the age of 17 she had bought a bigger boat. She passed her Yachtmaster qualifications with the highest possible marks, and at age 18 was awarded Young Sailor of the Year. And she set sail on her new boat, the Iduna, spending four and a half months alone sailing around the British Isles. After waving her parents and siblings goodbye, she was truly alone, coping with every problem and difficult decision without help. In her own words, she left the harbour a shy girl and returned a young woman who was learning how to handle being alone, how to deal with fatigue and stress and how to make life and death decisions. In an attempt to take her dream to the next level, she wrote 2,500 letters to potential sponsors. Only two even replied. 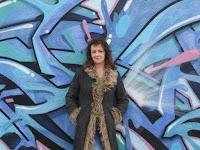 She persevered, living in a Portakabin with just £10 a week for food. She had found a business partner, although in her autobiography, "Full Circle" she says, "We had nothing bar enthusiasm and the most intense ambition..."
A surprise legacy from her nan enabled her to enter a transatlantic race, in a boat chartered at the last minute. She won her class, and her victory at just 22 years old persuaded Kingfisher plc to sponsor her entry in the Vendee Globe, a single-handed round-the-world race, sailed not only alone but without assistance. She came second. Those who had thought her previous triumphs were just luck were forced to take her seriously. In November 2004, aged 28, she set sail from Falmouth in an attempt to break the world record for single-handedly sailing around the world, a distance of some 27,000 miles. The record had only recently been set, in a bigger, faster boat, and was considered unassailable. Ellen MacArthur spent seventy-one days alone, enduring everything the oceans had to throw at her. She slept little, and for no more than twenty minutes at a time. Her mental toughness has always amazed and inspired me. I can't imagine what she went through on the voyage. While there were highs, and records along the way for the fastest speed times to the equator, the Cape of Good Hope, Australia, Cape Horn and back to the equator, there were lows as well. In the Southern Ocean, the waves can be as high as five- or six-storey buildings. She was on a multi-hulled boat, a dangerous proposition in such huge waters and when faced with icebergs and gale force winds. She knew full well there was a risk of death. Her exhaustion was obvious in her video diaries. She badly burned her arm while changing generators and suffered injury scaling the mast to carry out repairs. The loneliness is something very few people could cope with, let alone keep functioning through to achieve something so momentous. The colours of the oceans and the heavens must have been burned into her brain by the end. Every soft shade of grey and all of the dark purple slate colours of storm clouds. Hour after hour spent gazing at the sea and the sky. I imagine that days went by when all she saw was a monochrome palette. And I can picture the gift of a beautiful pink and orange sunrise after a black night of sleepless exhaustion. When she returned to Falmouth, 71 days, 14 hours, 18 minutes and 33 seconds after she set sail, the record was hers. Later that year she became the youngest person to be awarded Dame Commander of the British Empire. Hers is a story that I love to hear. There was nothing in her background to give her an easy passage into the exclusive world of competitive sailing. She overcame impossible odds, she persevered and she never, ever gave up. Her attention to detail was meticulous. She was always the best that she could be. She is for me one of the most inspirational people in the world. I draw on stories like hers when I need strength. I can't imagine that she would hesitate when it comes to a dream. Problems are there to be overcome. There is always a way forward. It seems to me that to succeed, maybe your enthusiasm and ambition just need to burn brightly enough. Start small. Keep pushing. And the world can be your oyster. What a wonderful, inspiring post! I agree, Dame Ellen is phenomenal, a true role model. An amazing story isn't it? I can't begin to imagine what it must have been like as I am terrified going on the Isle of Wight ferry and hold on tight for the hour or so it akes to get there!! What an inspiring woman. We have a sailing boat. That is we have a quarter of a sailing boat. We bought a share in one when we moved to St Ives. I have to admit that it is only Marc that uses it. The older boys have said that Dad "is mean in the boat" which I think is code for them not liking being told what to do. I have sat on the shore and watched the boat go out and race on Saturdays and Wednesdays, wishing I could go too. But there has always been a baby or a small child to look after. We also have a tiny fishing dingy. that we own with three other people. It cost us £100, so you can guess how humble it is. At the weekend we took Olly out in it for the first time. He even took charge of steering! I loved every minute of it, and didn't want to come back into shore. It is a lovely feeling. I loved this post, CJ. Thank you. Lovely post CJ, I remember following the news reports of Ellen and thinking at the time how amazing she was. As for sailing ... Oh Yes its stressful .. when either your Dad, your husband or your brothers are yelling at you to 'mind your head', 'get out on the trapeze', 'mainsail up' ... oh happy times ! I think you're right about the sea colours and the motion of the water being calming , maybe tha'ts why so many people feel the pull to the sea once retired. I loved this post CJ, such an inspirational story beautifully told. My parents were not well off but loved sailing a small dingy on the lakes and coast before they had children. It's a shame they didn't have the opportunity to introduce my brother and I to this pastime. A truly inspiring story. I'm not that keen on boats, I prefer to keep my feet on land as I don't really have sea legs, though we did have a holiday on the Norfolk Broads one year. Oh, thank you for this fabulous post. What a woman! Your writing here is beautiful. I grew up on an island and the sea was never far out of sight. My daddy fished and I was on a boat a few times, but never really felt the pull for sailing. I did love being in the water, swimming and paddling around, tho. That is one very determined lady!!! But, when you love something with all your heart, the sacrifices are worth it. Now I just have to figure out what I "love with all my heart" and get to it, right? A really interesting post ,she is certainly one determined woman. This is such a beautiful piece of writing you should be very proud. Another most enjoyable, and interesting, post. I had a friend who was into sailing in a big way who started out on Mirror dinghies at the local lido and ended up sailing round the world more than once. Brilliant post Claire and beautifully written, and oh how I agree about the incredible, inspirational Ellen MacArthur. And of course now the work the Ellen MacArthur Cancer Trust and Ellen MacArthur Foundation does is extending her amazing legacy. I am now convinced we will be reading about your sailing exploits sometime soon! We had a very rough crossing one year from St Malo to Portsmouth. I'll leave the sailing to someone who enjoys that sort of thing! Isn't it a good job that neither Martyn nor I like being on the watert? Wow. This was beautifully written. Thank you for sharing this amazing story! What a great post CJ, you write so well. Dame Ellen's achievement was phenomenal and she is a truly inspirational lady - I love (true) stories of triumph over adversity. Lovely photos of calm seas. Have a great weekend. Wow, what an amazing story, I really knew so little of if before now and it is certainly inspirational and a reminder to never give up. A really amazing post. I barely knew anything about her :). I love everyone's different interpretations of the prompt. You write so well CJ.